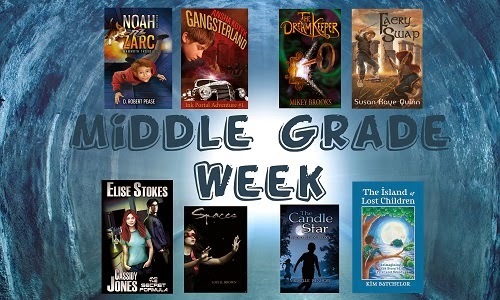 Let’s Celebrate Middle Grade Week! Michelle here…I’m super excited about participating in Susan Kaye Quinn‘s Middle Grade Week. She’s the one who created these posts (on Blogger…so bear with the WordPress funkiness) and put the whole week together. I actually read her MG book, Faery Swap, about a month ago. (I’ll be posting my review in March, I think.) Anyway, it’s well done. Sue is a world-class indie author with a real head for the business. I was thrilled when we sneaked her in as our last Emblazoner. And without further ado…Middle Grade Week! Sci Fi for the Middle Grade Set: a post with MG author Dale Pease about writing SF for kids. Publishing middle grade novels isn’t easy. It’s hard along the traditionally published route unless you happen to be writing what publishers are looking for. I know this first-hand from querying my first middle grade novel (a space opera) only to be told it was great, but could I please rewrite it to be more like A Wrinkle in Time? (note: my book was nothing like A Wrinkle in Time) I naively thought there weren’t MG SF novels like mine on the shelf because no one had written them! Unfortunately, things aren’t any easier on the self-publishing side: kids themselves don’t generally discover their own books on Amazon, and reaching the teachers, librarians, and parents who recommend books to kids can be difficult when mainstream children’s reviewers still close their doors to indie published authors. But times are changing. More kids have ereaders and are discovering they can shop from their devices. More teachers, librarians and parents are discovering indie works that they themselves enjoy and aren’t as dependent on the mainstream children’s reviewers to find quality works. And indie MG authors are getting savvy about how to reach their readers. So I finally took a deep breath and launched my first middle grade title, Faery Swap. Warrior faeries can be very stubborn. In Faery Swap, warrior faeries steal mathematical knowledge from humans to enhance their magickal faery powers. This message embedded in the book – that knowledge is power and math is magick – is one I’m passionate about and hope will reach middle grade readers. I knew I could do that with author visits to the classroom, but there’s only so much time in the day. So I created a Virtual Author Visit, so any teacher, anywhere on the planet, could share this message with their students. This dynamic video brings Author and Rocket Scientist Susan Kaye Quinn (Ph.D. Engineering) into your classroom, sharing her background in science and engineering and talking about her book, Faery Swap, where warrior faeries steal mathematical knowledge from humans to enhance their magickal faery powers. Then she shows how humans use math in the real world to do amazing things… even without magick to help them. With the help of teacher-friend Risa Cohen, I designed a Teacher’s Guide to go with the video. These grade-level-specific activities follow Common Core Math standards and are designed to follow-up what students learn in the video, using the Faery Swap story to reveal the power of math and science in everyday modern life. A card-based game where students break into groups representing different Faery Houses and compete to gain points by convincing a Human (teacher) to give them Knowledge Cards. The 17 equations used to create the easy-to-print Knowledge Cards are based on the 17 Equations That Changed The World and give information about what each equation does, who invented it, and how it is used in modern everyday life. All of that provides teachers with what they need to bring the message (knowledge is power) into the classroom. But how to entice teachers to consider taking a peek at these materials? And how to tempt students to read the book? I met with the principal of my kids’ school to ask for help. He was enthused, but wanted simpler materials to get things started. (a one page handout for teachers, a two-minute trailer for kids). So, naturally, I hopped right on it! If you’re a school (or public) librarian, the trailer can be used as an introduction to the book, should you choose to stock it in your library. I would also be happy to send you FREE bookmarks to pass out as prizes to your students. Recommend the author visit and activities to your favorite teacher! Or you could just show your kids the trailer and see if they’re interested. If you tell them there’s a Knowledge Seekers card game to go with it, that might intrigue the gamers among them. All the activities (and even the author visit video) are designed to work both inside and outside the classroom, for homeschoolers or for parents looking for supplemental educational activities for a cold Saturday afternoon or long summer day. This is just one prong of a multi-approach marketing plan for reaching middle grade readers. I’ll be talking more about the other aspects of middle grade marketing at the end of the week, with Marketing Indie Middle Grade – The Hardest Sell. Always keep learning… just in case! Faery Swap is on tour March 3rd – March 21st with a $25 gift card and magick wand giveaways! Sign up here. 🙂 I’ll tell her, Erik. She’s posting on multilple blogs this week and probably won’t get around to visiting all of them. Enjoyed the post. Didn’t realize how really difficult it is to get an Indie MG book out there. Many tweens are relying on parents and teachers for suggestions. Enjoyed your thoughts Susan as you had many good promotional ideas. Your book sounds interesting.